Story: Charlie aka Marky Mark was rescued as tiny, dirty and dehydrated kitten covered in bite wounds and Squeak was rescued from the side of the road. They both met at their current foster home and the rest is history as they say. Even though these 2 were rescued separately they share an incredibly special bond. Charlie boy being the shy one and Squeak, typical girl, being the crazy one. 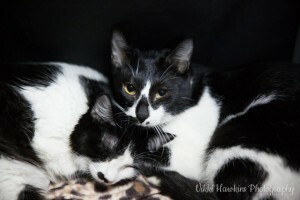 They come as a package deal and are good with other cats in case you already have a pet.